The white geese (genus Chen) breed on subarctic areas of North America and around the Bering Strait (situated at the easternmost point of the Asian continent and Cape Prince of Wales, Alaska, USA, the westernmost point of the North American continent - slightly south of the polar circle. These migratory geese travel south for the winter. The plumage is either white all over, or colored in various dark bluish-grey hues. The wingtips are black. 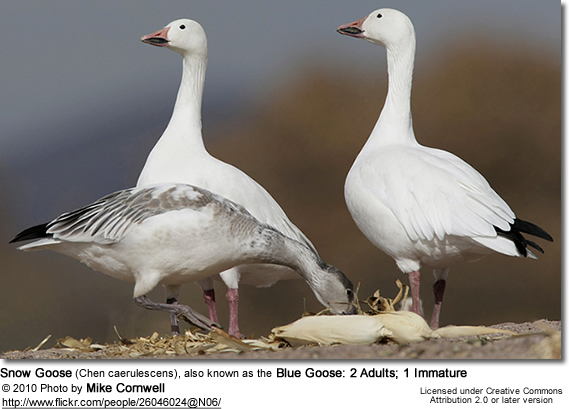 White-phase snow geese can be told apart from feral geese by the more slender, elegant neck. They often lack black wingtips. The feet, legs and beak are reddish in color. Snow Goose, Chen caerulescens - Breed north of the timberline in Greenland, Canada, Alaska, and the northeastern tip of Siberia. Winter in warm parts of North America from southwestern British Columbia. 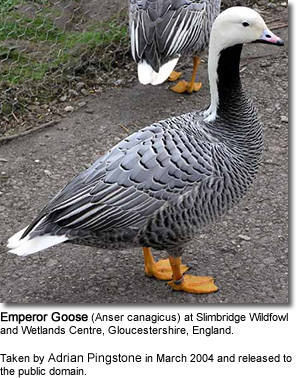 Emperor Goose, Chen canagica - Breed around the Bering Sea, mostly in Alaska, USA, but also in Kamchatka, Russia. Wintering mainly in the Aleutian Islands in the Northern Pacific Ocean westward from the Alaska Peninsula. 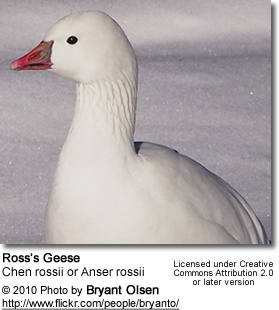 Ross's Geese - Chen rossi - sometimes separated in Anser. Breed south of Queen Maud Gulf and west of Hudson Bay. Winter in California, Texas and Louisiana, United States.